Whether you’re quite traditional, or simply looking for something with a bit of old-world charm, a wooden garage door is just the thing for you! You can go plain and simple, or quite dramatic with color and design. However, to keep it looking beautiful, there are some easy maintenance tips to follow. Carry on reading to find out more. While an obvious, but often overlooked, step, a clean garage door is the perfect and only place to start. We may not realize this, but dust and dirt have a way of getting trapped into even the tiniest of cracks and crevices of your door. Clean water and a brush should do the trick. Make sure that you leave plenty of time for the inside and the outside of your door to dry before using any products on it. Just as we need help against the elements with a warm coat, your residential garage door also needs some protection against the harsh weather. You may feel tempted to just apply a thick layer of paint, but that may not be the best type of coat your door needs. Because your door moves up and down so much, even good-quality paint may flake or crack under this pressure. A better option may be to use penetrating finishes such as oils and stains. They’re much more flexible and will last longer. Just make sure that you cover the whole door, including the corners. Also, remember that the inside of your door needs some attention too. It might not be exposed to the elements, but it is still wood and needs to be treated with care. Your garage door consists of a number of components to get it working smoothly. All of these moving parts need to be lubricated every three to six months. These include your garage door’s springs, cables and hinges. If your door uses a chain, it may need special lubricant. Your garage door opener is vital in ensuring that your automated door opens and closes when you need it to. Always make sure that there are no debris or insects around the interior parts, and also lubricate it at least once a year. It's best to have your door and opener serviced at least once a year. 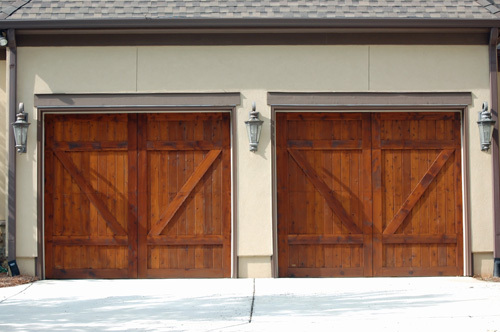 If, however your door seems to be faulty, contact our garage door company immediately. Even though these are simple-to-follow tips, garage doors are complex products. They are extremely heavy and some of the internal parts carry a lot of this weight. Even the most experienced DIY enthusiast should not attempt to fix a faulty door.